Is gazumping back on the agenda? Charlie Perdios, one of the owners of Anthony Pepe & Co estate agents, sees some light at the end of the tunnel. He says that, after several tough years, the housing market is once again on the rise, which is good for business and means he is hiring more people. But a pick-up in the market also means a return of gazumping - when a buyer thinks they have agreed a deal to buy a house only for another buyer to step in and outbid them. "I don't think it is as bad as it was five or six years ago yet," says Mr Perdios. "Unfortunately, gazumping is a by-product of a stronger housing market." Signs of a more active market have been clear from recent figures. For example, data from HM Revenue & Customs shows that the number of sales of UK properties rose by 19% in August compared with the same month a year earlier to 89,460, on a seasonally adjusted basis. If a buyer is gazumped they can lose the money they had already committed to conveyancing fees or paid to a lawyer. It can benefit the estate agents financially in the short term, although it could damage their reputation if it happens constantly and they face a string of angry buyers. An estate agents firm gets a fee made up of a percentage of the final price. For example, if a new offer is £10,000 more and the firm is on a 1.5% fee, then the business gets an extra £150. The individual estate agent who is on commission only gets a small percentage of that. 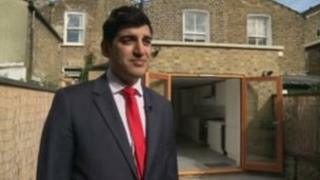 "If a buyer gets gazumped, 10 times out of 10 they will blame the estate agent, call up and complain," Mr Perdios says. Often they will go on to buy a different house in the same or a similar area. "When it comes time for them to eventually put that on the market, they will remember and won't pick you to be their agent," he says. "The reputational damage isn't worth it." The rules vary across Britain. While gazumping is legal in England and Wales, in Scotland it cannot be done. Once an offer is made on a house and accepted in Scotland, it is legally binding. So should the same rules apply in England and Wales? "Gazumping is an unpleasant experience and we would not condone or encourage it in anyway," says Mark Hayward, managing director of the National Association of Estate Agents (NAEA). "However, introducing a law may be counterproductive in the majority of cases. We operate in a free property market and it is within a seller's right to try and get the best possible price for their property from the most credible buyer." Yet gazumping can be bad news for house sellers too. "It can mean estate agents lose trust in the seller they were negotiating with," says Kate Faulkner, a property market analyst. "If they are willing to accept lots of competing offers it means they have got to keep going until the seller finally does agree to sell their home." Many house sales fall through before completion in England and Wales. A seller who allows a previous potential purchaser to be gazumped can be viewed with suspicion by anyone else looking to make an offer. "Gazumping is a really horrible thing to do to somebody," says Ms Faulkner. "The first thing I would do before I make an offer is make sure I am Ms Prepared." So how should somebody in the unfortunate position of being gazumped handle it? "Keep calm and don't panic," says Ms Faulkner. "Always put in an offer you can afford and don't let something like gazumping cause you to offer something you shouldn't and will regret later. "Usually what I find is that if you lose a property for any reason, that one wasn't for you and there's something better waiting just around the corner."